Once you’ve zip-lined through the rainforest, give your friends and family back in the U.S. a call to catch up! Vonage makes calling the U.S. from Costa Rica effortless, so you can tell mom, dad, friends and anyone else about your adventures without worrying about taking out a calling card loan. Vonage makes it painless to learn how to call the U.S. from Costa Rica. Vonage is shipping Vonage Boxes™ via UPS to Costa Rica. Vonage Boxes are simple to set up, are portable and will give you the call quality you deserve. Which plan do I use to call the U.S. from Costa Rica? Calls from Costa Rica to the USA to landlines and mobile handsets are unlimited¹. Call quality is strong and keeps you connected without interruption. Call domestically — when a Vonage Box is shipped from the U.S. to Costa Rica, that box has a U.S. number, meaning any U.S. number calling that box won’t be charged international long distance. It’s a U.S.-to-U.S. call! Vonage never charges hidden fees or surprise rates, allowing you to connect more with those you love for less. 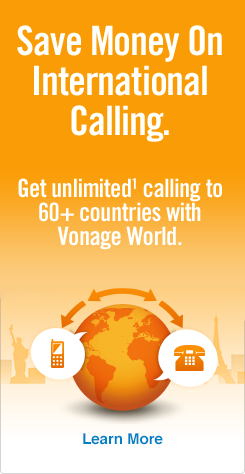 The Vonage World Plan allows you to be close, even when you’re far. It’s simple to call the USA from Costa Rica, so you’ll never be out of the loop — no matter where home is.